It's been a few months since my last post (again), but guys -- this time I have a good excuse. I am very pleased to announce that hubby and I are expecting our first baby in September! The last few months have been spent eating dry crackers, drinking lemon & ginger tea, and generally just doing my best to keep food down, so blogging has not been high on my list of priorities. Another "bonus" is my much improved and relaxed mood, and it appears that those pregnancy hormones have had a calming effect on me. Let's hope this lasts! I've also been lucky to have not suffered too much in terms of exhaustion that many others experience; in fact, I've managed to keep up my work, my usual exercise (yoga and pole fitness - don't worry, this has been approved and actually recommended by both the midwife and GP), and even managed several long (20km+) walks on our recent break to the beautiful island of La Palma over Easter (where the photos below are taken). Although I'm still suffering from waves of nausea, things are definitely on the up, and I'm finally beginning to gain a bit of weight, too. Even from as early as 10-weeks, when I had managed to lose a few pounds through all the vomiting, I began to notice a little bump in the evenings. Not long after that, certainly before the end of the first trimester, I could no longer button up my trousers/jeans. This brought me back to my sewing room, renewed with energy to knock up a maternity wardrobe. The first things I made, to see me through the first trimester without needing new clothes (and to an extent to help me hide my ever expanding waistline), were a couple of belly/bump bands. They were easy to make, using fabric from my stash, and are so comfortable to wear. I'll write a short post on those another time, as I couldn't wait to share a shiny new dress with you today! Its the Deer & Doe Givre (maternity) dress. I've wanted to try a Deer & Doe pattern for so long, and it certainly did not disappoint! 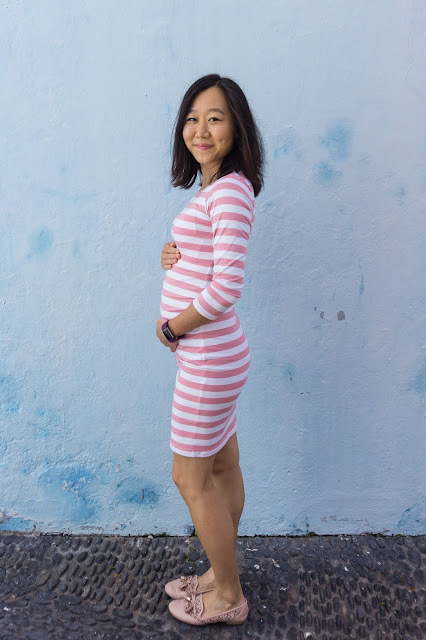 One of the best things with this pattern, which sets it apart from all the other maternity sewing patterns on the market, is that it offers 2 "bump sizes" based on how far along you are in the pregnancy. I'm 17.5 weeks at the moment, i.e. 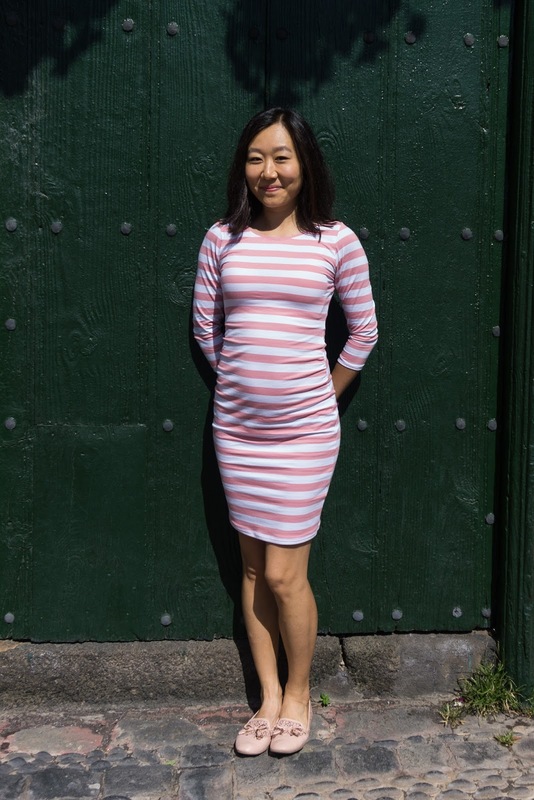 an awkward middle ground where most shop-bought maternity clothes are far too loose, but my usual clothes are far too tight. Givre comes to the rescue! See the gathers in the side seam in the picture above? These are designed for 3-6 months bumps, and the dress fits perfectly, yet still leaving more room for the coming weeks. 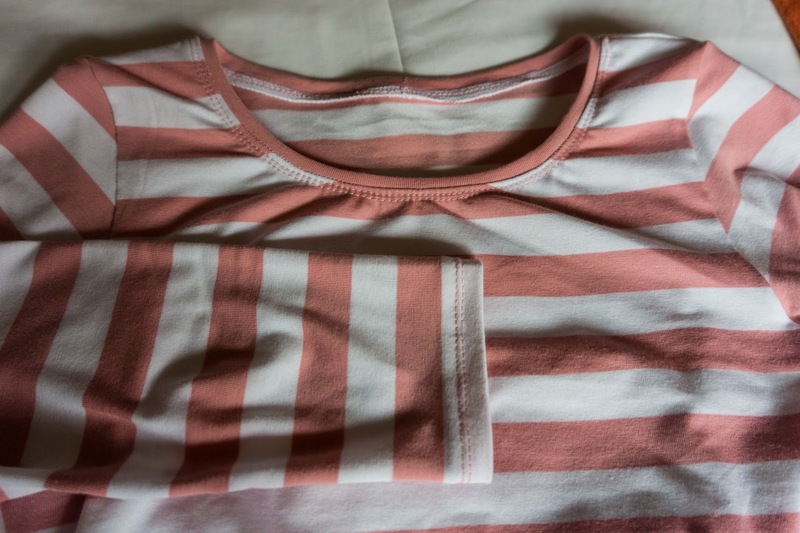 I used a cotton jersey with 5% elastane from Mineva, in white and rose pink. It is easy to handle (not too much curling), comfortable to wear (cotton + jersey + a good amount of stretch = recipe for comfort), and not too see-through (thank goodness). 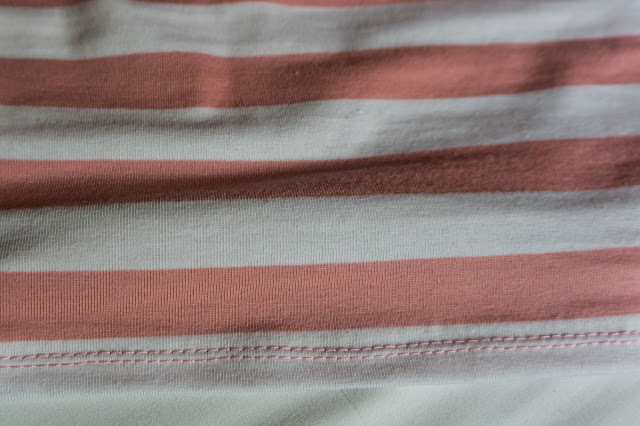 The stripes are also broad enough to allow me to sew up a neckline band that is in rose pink only, without needing to buy matching fabric. I can't tell you how happy I am to have embraced sewing with knit fabrics over 3 years ago (seriously? It's been more than 3 years since I made my lady skaters? ), as the skill has certainly come in handy now! I'm still learning, though, and I have to admit that getting the twin needle stitching right, particularly for the hem, took quite a few goes. I had quite a bad case of skipped stitches despite using stretch/ballpoint needles. I suspect this is due to the use of wonder tape (since this only happened in the skirt hem where I used wonder tape), and even now the hem/twin stitching is not as stretchy as I'd like it to be. If you have any tips on how to avoid skipped stitches, and/or how to make the stitching a bit more stretchy, I'm all ears -- please drop me a comment! Overall though, this dress was a pleasure to sew. I omitted the yoke, and it was basically like sewing a long t-shirt, with clear elastic gathering in the side seams. In addition to the yoke omission, I also shortened both the bodice and the skirt slightly to suit my petite frame. Otherwise this fit straight out of the envelope in size 34. Even the stripe matching was not as hard as I feared - I focused on the parts of the side seams above and below the gathers, and job done! Here's a really clear tutorial from Taisia if you wanted to find out how to match striped knit fabrics for yourself. 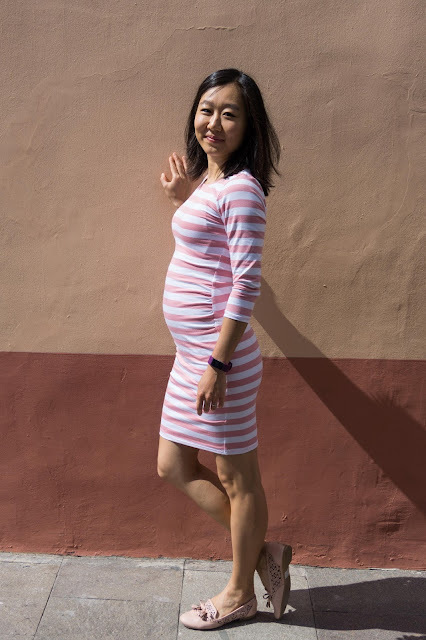 I loved how this turned out, and enjoyed walking around Santa Cruz, showing off my bump, and posing in front of colourful buildings in the sun. I'm already planning my second version in my head. Maybe a top next? Watch this space! 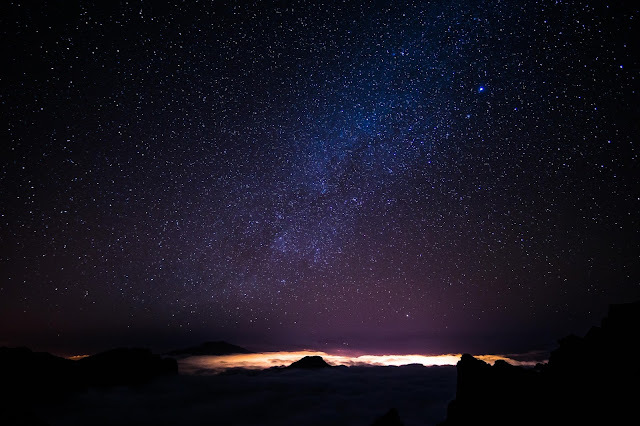 Finally, since you loved my astro picture from my last post (and incidentally another Canary Island), I'm going to reward you for reading this lengthy post with another from La Palma, which is a starlight reserve. How about a milky way (amongst many other stars) above a cloud-filled crater? Enjoy!